dialog from the File menu. For example, when importing a .csv file, you can create a whole new spreadsheet, append to the current sheet, add a new sheet to your existing spreadsheet or even replace your entire spreadsheet with this new version. Now with the new custom delimiters option, you can also specify what character to parse your data file with, giving you maximum flexibility when dealing with your data files. 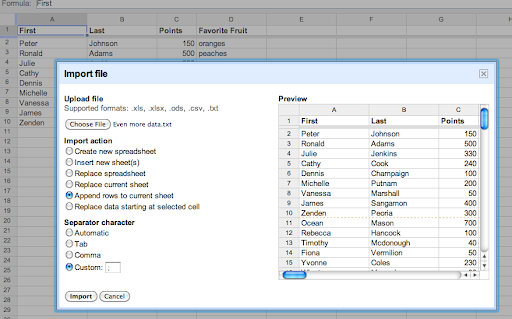 And finally we spruced up the dialog with a preview pane giving you a first glimpse to see how your imported data will look in your spreadsheet so you can make any changes if necessary. PS: If you're using Google Apps for your school or business, join us for a live webinar on Monday September 27th for a review of all the new Google Docs features we launched this quarter. 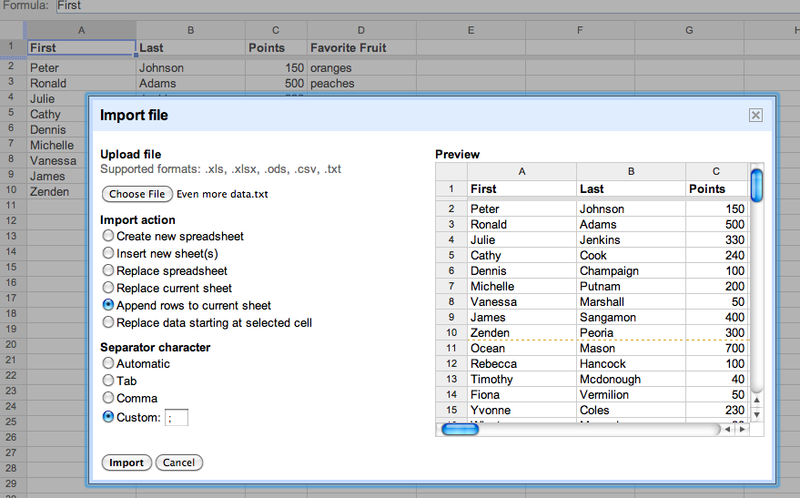 A spreadsheet without data and numbers in it can get pretty lonely, which is why it’s important to be able to easily import files full of data. Today we’ve improved the import dialogue to give you a full range of options of where to put that data. You can get to the new Import dialog from the File menu.